Rainy Day at Summer Camp? Have Fun with These Dry Ice Science Experiments! With any experiment, dry ice is the perfect material for creating fun and educational projects that allow kids to learn about safety and science. While kids may be out of school for the summer, there are still many ways to have with science! Although summer camp days most often consist of outdoor activities throughout the summer, dry ice is an excellent rainy day activity of fun and learning for kids! With any experiment, dry ice is the perfect material for creating fun and educational projects that allow kids to learn about safety and science. For a rainy day plan this summer, consider these fun dry ice experiments for kids to enjoy. Watch as the dry ice transform into a cloud of CO2 and water vapor from warm water. This cloud is safe to touch, as long as the piece of dry ice is not touched directly. Eventually, the dry ice will cool the water, and the cloud or smoking effect may lose its shape. Watch dry ice mysteriously disappear as it is placed next to a regular ice cube side by side on separate plates! Unlike the regular ice cube, the dry ice will disappear without a trace of water. Add drops of liquid dish soap to warm water in a tall glass. Then, carefully place dry ice into the warm soapy solution using gloves or tongs. In this step, it is especially important to avoid touching dry ice directly. The soap in the water traps the CO2 and water vapor, forming a bubble. Add food coloring to the solvent to create colorful bubbles in the solution or add a neon glow stick into the water for extra fun! Fill a bowl or pitcher with your juice of choice, then add a few pieces of dry ice using tongs to create your own bubbly beverage. As your drink begins to bubble, the liquid will become carbonated by the dry ice, taking the form of a sparkling mocktail. Fill the floor of a large container with approximately an inch of warm water, then add dry ice using tongs. 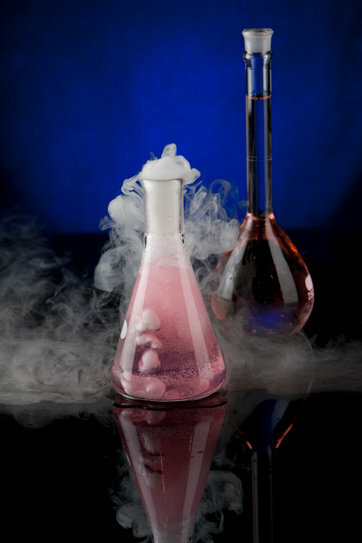 During this process, the dry ice will appear to be smoking as it transforms into a combination of CO2 and water vapor. You can then start blowing bubbles into the container or aquarium using a wand and a bottle of bubbles. Soon, the bubbles will appear to be floating in midair inside of the tank as they are floating on CO2. This entry was posted on Friday, June 22nd, 2018	at 3:15 PM	and is filed under The Science of Dry Ice	. You can follow any responses to this entry through the RSS 2.0	feed. Both comments and pings are currently closed.